Considered the classic text book of anyone who would study runes or the Northern tradition. Tales of Teutonic magic have thrilled the world for centuries. Now bringing together the dark stuff of sagas, Kveldulf Gundarsson reveals the personal magical path behind the legends and explains the practical techniques of the Northern tradition. Gundarsson is a well known expert on the esoteric lore of the Teutonic people. 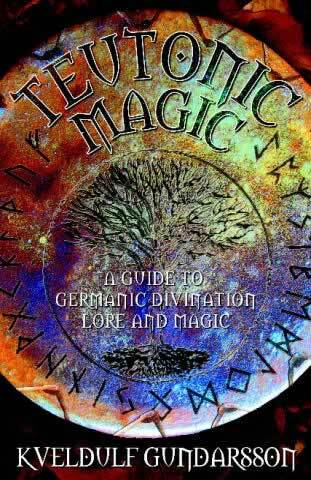 This, his first book Teutonic Magic, brings a lifetime's worth of expertise to the subject. Blending historical lore with practical experience of esoteric skills, Gundarsson presents the reader with a spiritual path walked by the ancient and dark age Germans. He explains the magical writings of the Teutons, including the uses of each of the runestaves, the laws of magic in the Northern tradition, he provides the key to unleash the awesome might of the Northern magical tradition. This is not a dry academic book. Gundarsson's writing flows like the sagas themselves, covering subjects such as Norse deities and rituals. It describes the structure of the spiritual realms in which the Norse magician would walk. It is no wonder that this book is considered the classic text book of anyone who would study runes or the Northern tradition.